Landesa, the inaugural recipient of the 2006 Henry R. Kravis Prize in Nonprofit Leadership, has just been named the 20th recipient of the Hilton Humanitarian Prize, which is the world’s largest humanitarian award. Established by the Conrad N. Hilton Foundation to recognize organizations that make extraordinary contributions to alleviating human suffering, the $2 million prize is the world’s largest. Landesa, (formally the Rural Development Institute) is an international nonprofit organization whose central mission is to strengthen land rights for millions of the world’s most disadvantaged populations. The underpinnings for Landesa can be traced back to the 1960s when law professor, Roy Prosterman, responded to a law review article with his own declaration on Land Reform in Latin America. By 1981, Roy Prosterman’s interest and research in land reform led him to launch the world’s first non-governmental organization designed specifically for partnering with governments to extend land rights to the world’s poorest. Decades later, Landesa has grown in reach, impact, and now in recognition. 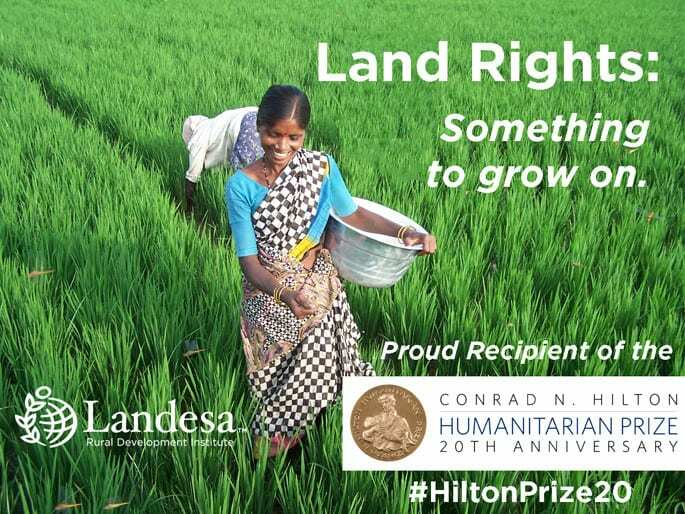 With operations spanning across 50 countries, offices in the United States, India, and China, it is no wonder that Landesa has now joined the illustrious ranks of the 20 Hilton Prize Laureate organizations. When asked about the impact of the Kravis Prize on Landesa, Roy Prosterman reflected on how the Kravis Prize was a significant factor in propelling Landesa to the next level as a bold, visionary organization. The Kravis Prize has had a very considerable positive impact on Landesa, which was the inaugural awardee, and the Prize is regularly cited in our public communications, briefings and grant proposals. Central to that impact has been the widely shared appreciation that the extreme rigor of the assessment process, used by a distinguished Kravis Prize Selection Committee, offers an exceptional degree of assurance that each of the successive awardees is indeed contributing in a notable way to the betterment of the human condition. The Prize has very effectively further elevated the issue of land rights and helped spotlight our organization’s work through the recognition it offers. We spent more than 20 years working out of a small apartment on an annual budget of less than $2 million. In fact, for much of that time, our budget was less than $200,000. We were so accustomed to our shoestring budget—on which we still managed to achieve significant impact—that it was difficult to imagine a major step-up. But winning the Kravis Prize gave us the impetus to change course. Our credibility and profile increased, and we invested in development functions. All of this led to various sources of new funding that fueled big efforts to scale.